Other 19th and Early 20th C. Artists with Surname "Munger"
George Munger [1771-1825], the son of Gilbert Munger's great, great, great grandfather Josiah, i.e. Josiah > Miles > Joel > Sherman > Gilbert. George was born in Guilford, Connecticut, and lived in New Haven. 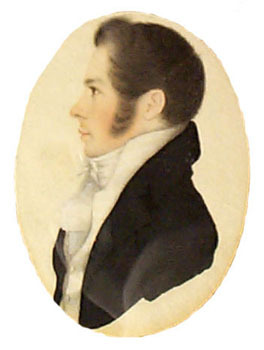 He was father to artists Caroline, Clarissa, and George Nicholas (see below). He was an engraver and is known for painting portraits and miniatures. 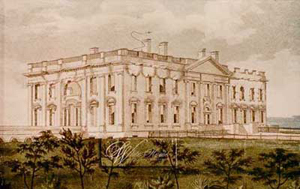 (left) George Munger's The President's House, watercolor of the burned White House, c.1814-1815, White House Historical Association. (right) George Munger's John Brown, 1815, graphite and wash on paper, 4 1/2 x 3 5/8 in, Maryland Historical Society, acquired 1951, gift of Miss Emma L. Stokes. George Nicholas Munger [1803-1882], the son of George (see above), was born in East Guilford, Connecticut. He was an expert mechanic and for many years made instruments for Yale College. The Library of Congress has in its collections a G. N. Munger Flute on C made between 1840 and 1843. He was a talented amateur painter. (right) Signed "Geo. N. Munger", title, date, & materials unknown , 19 x 12 in., image from Circa 1800 Fine Art Gallery, San Antonio TX, 2014. Caroline Munger [1808-1892], the daughter of George (see above), was born in Madison, Connecticut, and spent most of her life in East River, Connecticut, on the estate called "Wildwood." 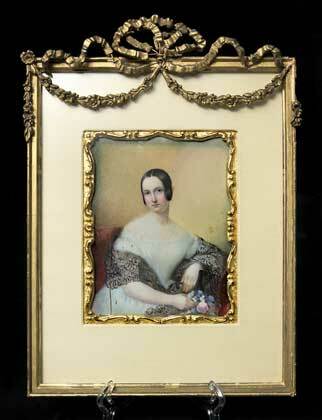 She is mainly known for painting miniature portraits on ivory. (right) Caroline Munger's Potrait on Ivory of Catherine Scranton, 1841, approximately 5 x 4 in., in the collection of the Madison (CT) Historical Society. Clarissa Munger [1806-1889], the daughter of George (see above), was born in East Guilford, Connecticut, and lived in Andover, Massachusetts, New York City, and Madison, Connecticut. She is famous (in her day called the best in America) for flower paintings that have been widely reproduced, especially in The Wild Flowers of America (1859). 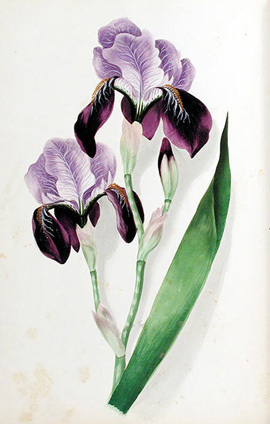 (right) Clarissa Munger's Iris, 1848, original watercolor leaf from privately published book Forget-Me-Not - Flowers from Nature - with Selected Poetry. Apparently this book was a prototype for The Wild Flowers of America. Ann Wells Munger [1862-1945] was born in Springfield, Massachusetts and lived for most of her productive years in Pass Christian, Mississippi, summering in Provincetown, Massachusetts. She painted landscapes and portraits in oil and pastels. 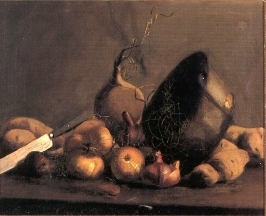 (left) Ann Wells Munger's Still Life, oil, 16 x 20, Barridoff Galleries, 2000. 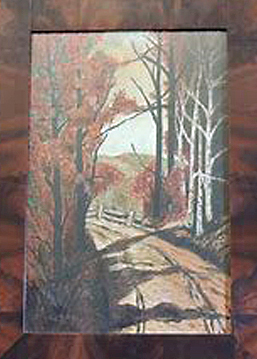 (right) Ann Wells Munger's By the Shoemaker's - Pass Christian Mississippi, oil, 14 x 10, Neal Auction Company, 1999. Rudölf Munger [1862-1929], born in Bern, Switzerland, spent the early part of his career painting and decorating the interiors of homes. He became locally well known as an illustrator, as a producer of posters and murals, and as a painter of glass windows. Starting around 1890 he produced some 19th C. style romanticized landscapes and some portraits of subjects in traditional garb. 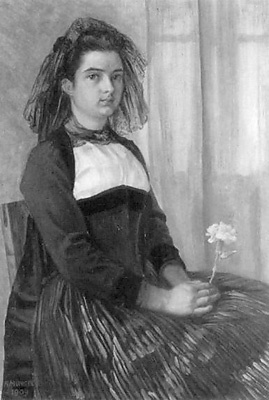 (right) Rudölf Munger's Porträt einer sitzenden jungen Frau im Trachtenkleid (1909), oil, 55 x 38 cm, offered at the 3 November 2000 auction of Dobiaschofsky Auction AG, Bern Switzerland. Robert Munger [1907-1981] was born in Aubonne, Switzerland and spent the first part of his career doing decorative wall painting. Around 1955 he produced some landscape paintings in oil and in watercolor, but then turned to abstract paintings. 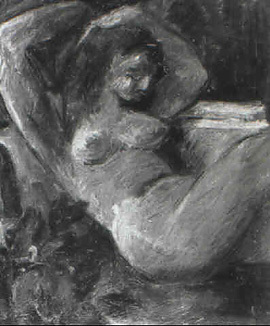 (right) Robert Munger's Liegender Frauenakt auf Sofa, oil on board, 46 x 38 cm, offered at the 7 May 1994 auction of Dobiaschofsky Auction AG, Bern Switzerland. 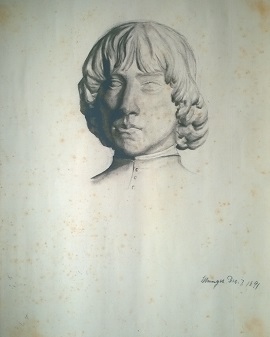 This Unidentified drawing was purchased by a West Virginia collector along with two other similar drawings at a California estate sale in 2014. They are dated Dec 7 1891 (see below), Dec 9 1891, and Feb 9 1892. While the quality of the draftmanship is excellent and the signatures are similar to Gilbert Munger's longhand signatures from 1892 letters, the signature match is not good enough to identify him as the artist. (right) Signed "Mung Er", Drawing of a Bust , charcoal on paper, 18.5 x 24.25 in. 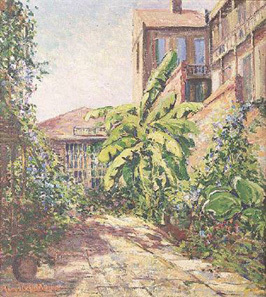 Additional painters named Munger: E. Louise Munger, New York, early 20th C; Ellwood Milton Munger, California, 1911-1988; Florence Munger, United States, 1939 exhibition record; Gertrude Munger, California & Connecticut, 1870-1940; Roseann Munger, Arizona, currently active.